Abstract: In this paper, I question the manner in which humanitarian assistance is carried out in relation to human rights in emergency circumstances. I put to test the humanitarian principles of humanity and impartiality on the basis of which I question why the situation of Somali refugees in Kenya is given more attention than the situation of Zimbabwean asylum-seekers in South Africa. Through a comparative analysis of the two similar cases I examine the extent to which the humanitarian principle of impartiality is applied in emergency response and by so doing I illustrate how human rights are transgressed in humanitarian emergencies. Behind the humanitarian mandate is the human rights agenda to promote the cause of humanity, which entails every action aimed at promoting the dignity of the human person and alleviating human suffering. I argue that the transgression of human rights in emergencies implies that the core values of humanitarian response have also been contravened. Humanitarian emergencies are becoming increasingly frequent and thus, for want of better protection of human rights in these circumstances, humanitarian policy-making and emergency response need to take an integrated approach combining needs-based and rights-based approaches. About the Author: Carol C. Ngang, LL.B, IDHA, LL.M is a doctoral researcher at the University of Pretoria, South Africa with research interests in the area of human rights and development, and humanitarian assistance. He is an alumnus of the Institute for International Humanitarian Affairs, Fordham University (IDHA 38) and has previously worked in development programs within the NGO sector in Cameroon and South Africa. In this paper, I question the manner in which humanitarian assistance is carried out in relation to human rights in emergency circumstances. There appears to be a fundamental disconnect between the obligations that Refugee Conventions and the Humanitarian Charter impose on states and on humanitarian agencies respectively and the practical realities on the ground. The Humanitarian Charter adopted in 2011 by the Sphere Project expresses the shared conviction of humanitarian agencies that all people affected by disaster or conflict have a right to receive protection and assistance to ensure the basic conditions for life with dignity. As Sean Lowrie points out, the Charter combines human rights law, international humanitarian law, refugee law, and humanitarian principles. Thus, it constitutes the binding instrument by which humanitarian agencies commit to act in accordance with the principles of humanity and impartiality to accomplish the humanitarian imperative that aims at every possible measure to alleviate human suffering. This notwithstanding, human rights organizations have decried the fact that response to humanitarian crises is often achieved at the expense of the dignity and fundamental rights and freedoms of victims. The United Nations High Commissioner for Human Rights has observed that “human rights considerations are often neglected and their relevance questioned as an immediate priority in the planning and implementation of relief operations”. The basis on which I formulate my arguments in this paper is drawn from the fact that humanitarian action imposes two duties: (1) the duty to protect, which is human rights-based and therefore must address the full range of human rights in humanitarian emergency; and, (2) the duty to assist, which is needs-based and thus must attend to the basic emergency needs of victims in a humanitarian crisis. These two aspects are supposed to work together to advance the cause of humanity, comprising of every action that aims at promoting the dignity of the human person as well as alleviating human suffering. 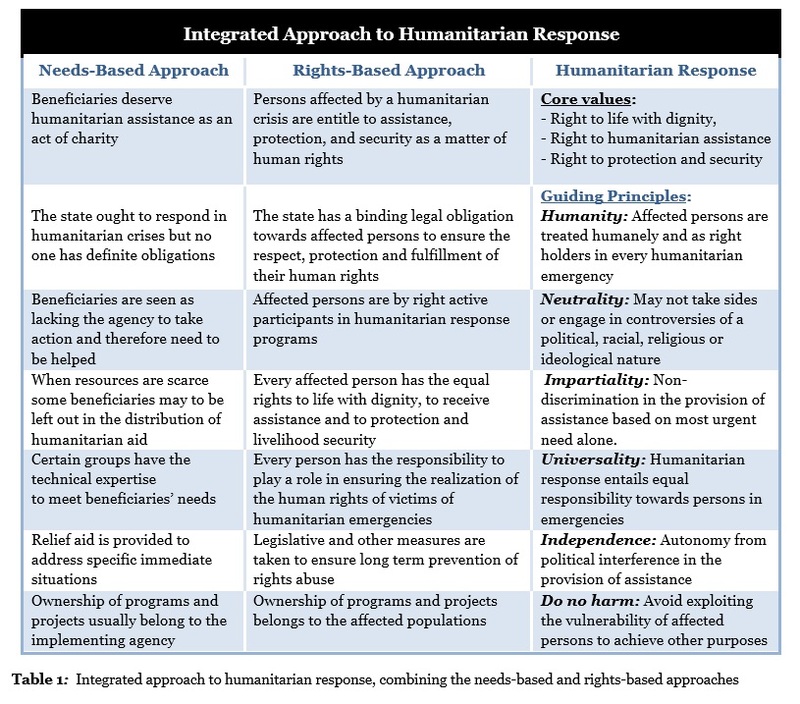 The purpose of this article is to illustrate how humanitarian response in emergency situations has been conceptualized to focus predominantly on the needs-based component, raising the question whether and to what extent human rights are taken seriously in humanitarian aid planning. This paper focuses on the situation of refugees and asylum seekers in Kenya and South Africa respectively, for a number of reasons. First, the circumstances that provoked the massive flight of Somalis and Zimbabweans across the border into the neighboring countries are similar, involving a combination of man-made and natural causes. Second, Kenya and South Africa, as receiving countries, are both developing countries with similar exigencies for international support in terms of humanitarian assistance. Third, Kenya is host to the largest number of Somali refugees in the world while South Africa is host to the largest number of Zimbabwean asylum seekers. Lastly, because the status of the persons concerned in both host countries are regulated by the 1951 Refugee Convention and the 1969 OAU Refugee Convention, which both countries have ratified, these two cases are suitable for comparison. This study uses a socio-legal approach owing to the fact that it raises a conceptual human rights and humanitarian question that has extensive social implications. There is a rich repertoire of existing literature on human rights and humanitarian response as well as other relevant materials relating to the subject. I relied extensively on the review and analysis of primary and secondary sources obtainable from the library and Internet sources. In this regard, I employed a combination of descriptive, comparative, and logical analysis to advance my arguments. The analysis, arguments and conclusions are made principally from a human rights and humanitarian point of view. Through this qualitative analysis I put to test the humanitarian principles of humanity and impartiality on the basis of which I examine why Somali refugees in Kenya have been given more attention than Zimbabwean asylum seekers in South Africa. I also consider how human rights are dealt with in both situations. The article is structured as follows: in section two that proceeds I examine how human rights relate to humanitarian action by focusing on the humanity factor as a principle that underlines humanitarian action. I then look at how the question of human rights is addressed in the case of Somali refugees in Kenya and Zimbabwean asylum seekers in South Africa. In section three I analyze the nature of the problem, exploring the causes of human rights transgressions in humanitarian emergencies and the implications for the future of humanitarian action. In the concluding section I make suggestions that may guide policy-making with regard to the protection of human rights in humanitarian emergencies. Humanitarian emergencies are becoming increasingly frequent and therefore pose serious challenges to humanity such that the criteria for determining the appropriate humanitarian response may need to be reconsidered. Generally, the extent of vulnerability that results from a disaster or conflict situation constitutes the criterion that determines whether humanitarian assistance should be provided. However, in present day emergencies involving the movement of large numbers of people across international borders, the motivation to leave one’s country is usually not caused only by disaster and conflict. It is often also caused by the fear of persecution that may result from the failure of the country of origin to ensure the exercise and enjoyment of essential rights and fundamental freedoms. The cause of the emergency should not determine the need for humanitarian action but rather the gravity of the crisis on the persons affected, which implicates the humanitarian principle of humanity. Because humanitarian action has often been queried for not sufficiently protecting human rights in emergency situations, an important question to explore is how human rights relate to humanitarian action. Human rights are a combination of moral norms and values that uphold human dignity. They are in effect assertions of entitlement that are essentially inherent and inalienable to every human person by virtue of the fact that they are human. To say that human rights are inherent and inalienable means the human person is born with those entitlements, which cannot be taken away nor bargained for. In order for human rights to have a legally binding effect on states, the regime of universally recognised human rights has been enshrined in the International Bill of Rights, which provides the legal framework on which the Humanitarian Charter is founded. The Humanitarian Charter makes clear that though human rights are codified in international law, they derive their force not from the law but from the fundamental moral principle of humanity, which establishes that all human beings are born free and equal in dignity and rights. The fact that human rights are enshrined in legal instruments does not imply that they are granted by law. Rather, the legal recognition of human rights means that right holders can seek protection under the law when the rights are contravened or threatened to be violated. Human rights constitute the vehicle for advancing the cause of humanity, and therefore apply through the spectrum of circumstances, including during peacetime as well as in conflict and disaster situations. It is important to clarify that humanity, from a human rights and humanitarian perspective refer to the sacrosanct dignity attached to the human person, which may not be violated. In this regard, every human right or humanitarian action that aims at promoting the dignity of the human person and alleviating human suffering constitutes what I refer to as the cause of humanity. Just like human rights, humanitarian action also embodies the concept of humanity, which is framed in the humanitarian imperative to save lives and to alleviate human suffering. When a humanitarian crisis strikes, chaos sets in and prompts “fundamental judicial guarantees” to be suspended, sometimes by the formal proclamation of a state of emergency or simply by the de facto situation created by the magnitude of the crisis. When the circumstances necessitate, fundamental human rights and freedoms may be curtailed or derogated to allow stability to be restored. Notwithstanding the gravity of the crisis, certain human rights, particularly the right to life, cannot be derogated. However, because human rights are threatened, humanitarian action becomes the mechanism for ensuring that humanity is not eroded. In this regard, it becomes necessary to sustain livelihood subsistence rights, which include socio-economic rights to shelter, food, water, sanitation, and health care, in order to ensure the right to life with dignity. Ensuring that these rights are fulfilled advances the humanitarian agenda that aims at upholding humanity. The transgression of fundamental human rights in a humanitarian emergency means that the cause of humanity has been betrayed and the humanitarian imperative has also been contravened. The human rights ‘catch-22’ in humanitarian emergencies arises from the fact that in the course of humanitarian response the moral obligation to deal with issues relating to shelter, food, water, sanitation and health care are generally considered as emergency needs rather than human rights entitlements guaranteed both by international law and the Humanitarian Charter. These entitlements are often not seen from their legal perspective as human rights. Thus, humanitarian response is carried out more as an act of benevolence than as part of the humanitarian assignment that entails guaranteeing the human rights to life with dignity, assistance, as well as protection and livelihood security. Humanity is an essential element to life with dignity. It transcends the law and state sovereignty. It constitutes the common denominator that defines human rights and humanitarian action. It implies that to be able to serve humanity, humanitarian response and human rights advocacy must become complementary rather than confrontational. On account of the fact that human rights aim to advance humanity, humanitarian response must be programmed to ensure the protection of human rights in emergency situations for the same purpose of advancing humanity. This principle is difficult to translate into concrete action in real life circumstances, however. In the 1990s conflict and drought in Somalia caused an influx of Somali nationals seeking refuge in Kenya. Similarly, political instability and the victimization of political opponents by the Mugabe regime in Zimbabwe since 2007 and a cholera outbreak in 2008 triggered a massive exodus of Zimbabwean nationals into South Africa to seek a place of safety. Article 14 of the 1948 Universal Declaration of Human Rights recognizes the right to seek asylum in another country – a gesture that the Organisation of African Unity Convention of 1969 qualifies as a “peaceful and humanitarian act”. A refugee-receiving country, particularly one that has ratified the refugee conventions, is bound by the obligation to provide humanitarian assistance to persons who seek refuge in the country. In the event that such a country is unwilling or incapable of providing such assistance, humanitarian agencies are mandated to intervene to provide the necessary response. Owing to the humanitarian imperative, the Humanitarian Charter recommends three rights-based core values by which humanitarian response must be guided: “the right to life with dignity, the right to receive humanitarian assistance and the right to protection and security”. The fact that victims of emergency situations are guaranteed these rights means that they are ipso jure recognised as right-holders. By implication, legal and moral obligations are imposed on the state and humanitarian agencies respectively to ensure that these rights are respected, protected and fulfilled. Through a comparative analysis of the two closely similar cases that I examine below involving Somali refugees in Kenya and Zimbabwean asylum seekers in South Africa, I look at the extent to which the principle of impartiality is applied in emergency response and by so doing examine how human rights are dealt with in humanitarian emergencies. Kenya is host to the largest refugee settlement in the world, comprising of a population of over 463,000 Somali refugees living in the Dadaab Camps. Owing to the magnitude of these additional burdens on the limping Kenyan economy in the early 90s, the Kenyan government surrendered its responsibilities to protect and to assist the refugees. As the refugee influx swelled up, the United Nations High Commissioner for Refugees (UNHCR) and other international humanitarian agencies took over the mandate. As a result, management and sustainability of the Dadaab Camps has been under the responsibility and control of the UNHCR and other humanitarian organizations. The quality of response to the Somali refugee population in Kenya could accurately be rated a success story in humanitarian action given the sustained assistance that has lasted for twenty-five years. However, the Kenyan government’s policy of keeping refugees in permanent confinement to camp life contravenes the core humanitarian value of “right to life with dignity”. This is because it infringes upon the freedom of movement granted to refugees by Article 26 of the 1951 Convention and other international human rights instruments. In the instance where movement is authorized, the Somali refugees are required to possess a restrictive “movement pass”, which does not conform to the kind of travel document recommended by the Convention. International human rights instruments guarantee a range of fundamental human rights to everyone without discrimination. In spite of this, Somali refugees are denied full integration and are prohibited from taking up formal employment in Kenya – a policy that contravenes inter alia Article 17 of the 1951 Convention and Article 23 of the Universal Declaration of Human Rights, which both enshrine the right to work. Denying the Somalis the right to work has forced them into dependency on ‘therapeutic welfare handouts’ of food rations, which contravenes the Humanitarian Charter core value of the right to life with dignity. By this, I mean that though the distribution of food rations is always well intentioned, the manner in which it is done – often like prescription medication that the refugees have no option but to receive – might be considered humiliating. Meanwhile, a more uplifting strategy could be to create the opportunity for the refugees to provide for themselves by allowing for integration into mainstream society. The Kenyan government has however taken the option of repatriation as a lasting solution to the refugee crisis. Forceful repatriation constitutes a threat to life with dignity in the sense that it exposes the Somali refugees to insecurity and harassment meanwhile, “[a]ccording to international law, voluntary returns can only take place when safety and dignity is guaranteed”. With uncertainty about the repatriation process following the withdrawal of the Somali government from the Tripartite Agreement reached in November 2013 between UNHCR, the Government of Kenya, and the Somali Government, it is wrong for the Kenyan government to embark on compelling the Somalis to leave the country. Forceful repatriation amounts to a contravention of the principle of non-refoulement enshrined in the 1951 Refugee Convention, which stipulates that refugees cannot be expelled or forcefully returned to a country where their lives or freedoms would be threatened.Amnesty International reports that the Kenyan government has resorted to intimidation, abuse of human rights, and withdrawal of services, and hostile treatment that has forced some of the refugees to return to Somalia where ongoing conflict in parts of the country continues to pose a threat to life. Such actions constitute an abdication of avowed obligations under the refugee conventions and thus betrays the Kenyan government’s commitments under international law. Zimbabweans make up the largest number of asylum-seekers in South Africa, and as a group constitute more than all the other asylum-seekers from other countries combined. Statistics of documented cases provided by UNHCR put the number of Zimbabwean asylum-seekers in South Africa at 361,000, out of which only about 55,910 are provided some form of protection or assistance. Other sources that include undocumented cases estimate that the number of Zimbabwean asylum-seekers in South Africa is about 1,500,000 – the largest and most vulnerable contingent of all foreign migrants in the country. Alexander Betts estimates the number of Zimbabweans who fled into South Africa alone to be about 2,000,000. In spite of the discrepancy in the figures, they paint the picture of a humanitarian crisis deserving of international attention, particularly relating to the human rights of the victims involved. It is undeniable that the Zimbabweans who crossed the border into South Africa were “fleeing a desperate situation characterized by economic and political collapse, in which there were almost no viable livelihood opportunities to sustain even the most basic conditions of life”. Out of these numbers, a large proportion are wrongly categorized as economic migrants, probably because they fall outside of the conventional understanding of the refugee regime as defined by the 1951 Refugee Convention. Accordingly, the Zimbabwean victims who may genuinely qualify as asylum-seekers in terms of the 1969 Refugee Convention regime are wrongly classified as economic migrants and therefore, deprived of the opportunity to benefit from the advantages attached to the status of being asylum-seekers. In spite of the magnitude of the humanitarian crisis involving Zimbabwean asylum-seekers, humanitarian assistance to this group of victims has been low-key and biased compared to the high-level response to the Somali refugee population in Kenya. Impartiality as a humanitarian principle requires that humanitarian response should be provided in a fair and equitable manner. It has however not always been so. Evidence of such bias can be seen in the way the Somali refugees have been treated as opposed to the way response to the Zimbabwean asylum-seekers. In the case of the Somali refugees, in spite of the Kenyan government’s abdication of its treaty obligations, there has been an impressive response by humanitarian agencies, including UN Agencies, Norwegian Refugee Council, Care International, Médecins Sans Frontières, and a host of others that have been involved in the Dadaab camps. Through the work of these agencies, the Somali refugees are sheltered in camps where they are provided with the essentials for survival such as food, water and sanitation, and health care, which to a certain extent may be said to ensure protection and livelihood security. On the other hand, the situation of the Zimbabwean asylum-seekers has not been met with the same kind of response. Like Kenya, the South African government has also neglected its obligation to provide assistance to the Zimbabwean asylum-seekers as required by the OAU Refugee Convention. Unlike in the case of the Somali refugees, the international humanitarian community has largely failed to provide the necessary response as mandated by the Humanitarian Charter and thus, the Zimbabwean asylum-seekers, in spite of their circumstances, are abandoned to fend for themselves amidst threats to life in the host country. According to the OAU Convention definition of a refugee, which outlines the causes of displacement to include “…events seriously disturbing public order in either part or the whole of [their] country of origin or nationality”, Zimbabwean asylum-seekers qualify for refugee profiling in the sense that political instability and cholera outbreak destabilised public order in Zimbabwe and thus caused the displacement of hundreds of thousands of peoples, a large proportion of whom turned to South Africa to seek refuge. This notwithstanding, the South African government generally classifies them as economic migrants, in which case they are denied necessary protection and assistance. In principle they are granted freedom of movement, free integration into South African society, and the right to work. The reality however, as Jost el al have pointed out, is that many professional bodies, government departments, and other work places are regulated by stringent policies that disqualify asylum-seekers from employment. South African immigration policy prohibits the employment of foreigners unless they are in possession of a valid work visa, which in most cases asylum-seekers are unable to obtain. Thus, despite being allowed to work, it is often practically difficult for them to access meaningful employment. Faced with the reality of unemployment and job scarcity in South Africa and the need to secure jobs for nationals, allowing asylum seekers to freely integrate and to work raises genuine security and protection concerns. With an unemployment rate of over 25.5 per cent, the Zimbabwean asylum-seekers tend to compete with the largely unskilled local population for the few available menial jobs at exploitative wage rates. This creates tension to the extent that built-up animosity among South African nationals erupted into violent xenophobic conflicts in 2008 where lives and valuables were lost. Sporadic xenophobic attacks continue to happen and in most instances Zimbabweans are specifically targeted, arrested, and deported even against their willingness to return home because of the ongoing political instability. Such actions contravene Article 31(1) of the 1951 Refugee Convention, which forbids any asylum-seeker or refugee to be penalized for irregular entry and stay in the host country. Zimbabwean asylum-seekers in South Africa face a humanitarian crisis equally as threatening to their survival as the Somali refugees in Kenya. However, the former remain marginalized and deprived of the protection and assistance they should by right be entitled to. Unlike the Somali refugees who have the privilege to be accommodated in camp shelters, a majority of the Zimbabwean asylum-seekers live on the streets in the major cities in South Africa without legal documentation and without access to the most essential requirements for survival. The slum shelters that some of them manage to find are often over-crowded and have poor water, sanitation, and hygiene facilities that do not measure up to The Sphere minimum standards. Access to health care for this group of persons is complicated. Without legal documentation and proof of a residential address, Zimbabwean asylum-seekers are barred from accessing health facilities. Meanwhile, the right to health care constitutes one of the most fundamental socio-economic entitlements guaranteed by international human rights law as well as Article 27(a) of the South African Constitution. The right to life with dignity, the right to receive humanitarian assistance, and the right to protection and security has simply become an illusion for the Zimbabwean asylum-seekers. As it is noted, “those who are denied their rights do not find the matter quite so complicated” but more often than not, we “remain stuck on defining rights in ratified, doctrinaire meetings rather than simply getting on and implementing them”. It is incomprehensible that in spite of the human rights and humanitarian obligations to which the South African government and the international humanitarian community have committed, they have failed to create the opportunity for the Zimbabwean asylum-seekers to exercise and enjoy the rights guaranteed to them under refugee law. For reasons discussed above, the situation of Zimbabwean asylum seekers in South Africa is neglected, and thus the human rights of the victims are implicated. The entire Humanitarian Charter is conceptualized in human rights language, which implies that behind the humanitarian mandate is the human rights agenda, which ultimately must be achieved in order to promote the cause of humanity. The Zimbabwean crisis may not be seen to constitute a humanitarian problem in absolute terms but it threatens the humanity factor and thus creates a human rights problem worthy of humanitarian intervention. However, as necessitated by the humanitarian core values of the right to life with dignity, the right to receive humanitarian assistance, and the right to protection and security, the situation of the Zimbabwean asylum-seekers raises concerns about the principle of humanity that deserves to be addressed. This invokes the humanitarian imperative that necessitates action to prevent or to alleviate human suffering that, accordingly, may not be derogated. It does not suffice to make evasive allegations that human rights are violated or threatened in humanitarian emergencies or to simply point out instances of human rights violation. Doing so may help to raise awareness but without identifying the root causes the opportunity is created for perpetuation of the same problem. Consequently, I consider it important to look at the reasons why human rights transgressions take place in humanitarian emergencies and the implication for the future of humanitarian action. In relation to the two cases discussed above, I identify three fundamental causes that I proceed to examine. When a state ratifies a treaty, it becomes legally bound and obligated to honor the terms of the treaty. The pacta sunt servanda principle establishes as a fundamental rule of international law that a state party to a treaty is bound to carry out in good faith the obligations imposed by the treaty. The treaty imposes a primary duty on the state parties to ensure that the provisions are respected, protected, and fulfilled. The commitments that state parties undertake by ratifying refugee conventions create legitimate expectations that they are open to receive, to provide assistance, and to secure the settlement of asylum-seekers and refugees who seek sanctuary in their countries. When humanitarian agencies, particularly those working on refugees issues, situate their mandates within the framework of refugee conventions, they implicitly become secondary duty-bearers of the obligations imposed by the treaties and therefore have the responsibility to ensure that the treaty provisions are respected. I have indicated earlier that for the sake of humanity, in the event that a state fails in its obligation to provide humanitarian assistance, international humanitarian agencies have the moral obligation to ensure that the humanitarian imperative is accomplished. The Humanitarian Charter, which provides the ethical and legal framework to the humanitarian principles, makes this secondary obligation tenable, and provides core minimum standards to which humanitarian agencies commit to be bound to ensure the welfare of those affected by disaster and conflict. This secondary obligation has most often involved the active engagement of humanitarian agencies in emergency response operations. In some instances these agencies may be required to draw states’ attention to their treaty obligations, absent which, humanitarian agencies may also be guilty of abdicating their obligations under the Humanitarian Charter. When a state abdicates its treaty obligations it violates a fundamental principle of international law, and therefore becomes liable for breaching the terms of the treaty. The OAU Refugee Convention does not make stipulations for the formulation of a reservation on any of the provisions. It is clear that neither Kenya nor South Africa has at any point declared a denunciation of the treaty as Article 13 allows, which means their obligations under the treaty remain absolute. Accordingly, it could be argued that South Africa has abdicated its obligations under the refugee conventions by failing to extend a humanitarian hand to the Zimbabwean asylum-seekers. Similarly, by surrendering its responsibilities towards the Somali refugees and refusal to grant the option for settlement as provided for by Article 2(1) of the OAU Convention, Kenya may also be said to have abdicated part of its treaty obligations, thus denying the victims their human rights. Xenophobic nationalism constitutes one of the most glaring reasons why the human rights of refugees and asylum-seekers have been trampled upon in the course of emergency response by host countries. I define xenophobic nationalism to mean an intense national feeling or practice of negativism and intolerance towards foreign nationals. It amounts to looking at refugees and asylum-seekers as inferior human beings who do not deserve the same kind of dignified treatment guaranteed to nationals of the host country. It creates the situation where refugees and asylum-seekers, because of their vulnerability, are openly discriminated against and stigmatized as criminals, carriers of dreaded diseases, and job-snatchers. Xenophobic nationalism creates an atmosphere of fear and insecurity. The possibility of being attacked or treated with disdain thus affects the integration of refugees and asylum-seekers into the mainstream society of the host country. It also constitutes part of the reason, albeit wrongly and against treaty obligations, why host countries do not treat refugees and asylum-seekers appropriately. Bronwyn Harris has stated this fact by observing that “xenophobia constitutes a central feature of nationalism”. Xenophobic nationalism is most often legitimized through restrictive immigration policies and regulations that shift the responsibility of the host country from the principles of humanity underlying the refugee conventions that they have ratified to concerns about national security. Such policies and regulations convey sentiments that non-nationals, particularly refugees and asylum seekers, pose a security risk and are therefore not welcome in the country. It is undeniable that refugees and asylum-seekers may pose security risks. That, however, is a problem to be dealt with under criminal law. I argue that xenophobic nationalism constitutes one of the reasons that has caused the Kenyan government to quarantine the Somali refugees in the confinements of the Dadaab camps for about a quarter of a century and denied them the opportunity for free integration into Kenyan society. A Somali refugee is quoted as saying, “[h]ere, in Kenya, it’s like a prison. At night we can’t leave the house, in the day we might be arrested. It is not currently safe in Somalia, we hear of killings and murder, but the situation here is very desperate….” In twenty-five years, some of the refugees have had second and third generations of children who know nowhere else as home because they do not see themselves as Somalis, yet are not allow the right to be identified by Kenyan nationality. The situation in South Africa is even more manifest. When xenophobic nationalism erupted into violent attacks in 2008, Zimbabweans, more than any other group of asylum-seekers, suffered immense damage to life and property. Interestingly, the South African Constitution, which has been qualified as one of the most progressive in the world, stipulates in the preamble that South Africa belongs to all who live in it. I take for granted that this includes asylum-seekers who, due to a legitimate cause beyond their capacity to influence, find themselves in South Africa. Refugees and asylum-seekers obviously cannot be entitled to all the rights and freedoms guaranteed to nationals, such as the civil and political rights to actively participate in the political life of the host country. For the sake of humanity, however, they deserve entitlement to livelihood security and the right to life with dignity, which comprises of the socio-economic rights to food, shelter, water, sanitation, health care and of course education. In humanitarian terminology, victims of emergency circumstances are generally referred to as “beneficiaries” rather than as legitimate holders of the rights that are guaranteed by international human rights law and upheld by the Humanitarian Charter. Such perception plays enormously on how victims are treated in emergency situations. When refugees and asylum-seekers are referred to as “beneficiaries”, they are reduced to the status of mere recipients of charity and are therefore treated with disdain as I have illustrated in the case of Somali refugees and Zimbabwean asylum-seekers. This happens because, as I have pointed out earlier, humanitarian response is generally designed to focus mostly on the duty to assist according to which the basic emergency needs of victims are taken more seriously than the legitimate rights to which the victims are entitled. Humanitarian action relating to the refugee regime operates within the legal framework of the refugee conventions, human rights treaties, and other relevant instruments. This gives victims of humanitarian emergencies the status of subjects of law by which they are entitled to formulate legitimate claims against primary duty bearers, comprising of host countries and secondary duty bearers, which include humanitarian agencies. Taken as beneficiaries, victims become dispossessed of agency, although their interests in the implementation of guaranteed rights may be very important. Classifying victims of emergency as beneficiaries not only dispossesses them of the legal capacity to assert legitimate claims to humanitarian assistance but also deprives them of the procedural capacity to make such claims. As beneficiaries, the Somali refugees and Zimbabwean asylum-seekers are limited in their legitimate agency in asserting claims on the basis of the rights to which they are entitled by law. This creates the opportunity for transgression of the human rights of victims of humanitarian emergencies. When human rights are contravened in humanitarian emergencies, it negatively impacts the well-being of the persons whose precarious situation the humanitarian response is intended to ameliorate. This lays a risky precedent for the future of humanitarian work as humanitarian assistance may lose its significance and therefore defeat the purpose of trying to serve humanity. Transgressing human rights in emergency situations implies that the core values of humanitarian response, which are principally human rights-based, have also been contravened. I have argued elsewhere that no intervention on the pretext of protecting the human rights of vulnerable persons or of serving humanity is justified if it renders the situation worse than it would be without the intervention. Essentially humanitarian response is intended among other things to alleviate human suffering, which means every humanitarian action is supposed to improve conditions for persons affected by humanitarian emergencies. Humanitarian aid would serve no purpose if victims, who in the context of this paper include refugees and asylum-seekers, are subjected to almost the same circumstances that caused them to flee from the country of origin. The situation of the Somalis and the Zimbabweans illustrates the manner in which the human rights of victims of humanitarian emergencies have been dealt with. Humanitarian emergencies are not only becoming increasingly frequent but more severe, resulting in increased human casualties, damage to property, and displacement of people. As indicated earlier on, humanitarian action imposes the rights-based duty to protect and the needs-based duty to assist, which ultimately need to converge in order to advance the humanitarian imperative to alleviate human suffering. In this regard, unless humanitarian planning is properly conceptualized, victims will continue to suffer contravention of their inalienable human rights. By humanitarian planning, I refer to the process of policy-making, program-designing and on-the-field operations in response to a humanitarian emergency. This process needs to take an integrated approach to combining the needs-based and rights-based approaches as I have endeavored to illustrate in the following table. Refugees and asylum-seekers are endowed with the same attributes of humanity inherent to every other human being and are therefore guaranteed human rights. The fact that their status is forced to change from regular citizens in a stable and functional country to asylum-seekers or refugees in another country as a result of circumstances beyond their control does not deny their humanity or erode their human rights. Human rights are universally applicable; they apply in every situation and to every human person equally without distinction as to nationality or status. By juxtaposing the situation of Somali refugees in Kenya who have been treated to one of the most sophisticated responses by the humanitarian fraternity, I point out that the controversial situation of Zimbabwean asylum-seekers in South Africa raises questions relating to the application of the principle of impartiality in humanitarian response. Owing to the fact that both situations are similar as illustrated above, the principle of impartiality requires that the same kind of response is provided. I further argue that in responding to both emergency circumstances, human rights have significantly been compromised, thus exposing the victims to even greater vulnerability. Humanitarian response is normally intended to provide relief. It remains unclear at what stage an emergency necessitating humanitarian response should cease and translate into a development problem entailing development assistance to enable stabilization of victims. This is an important question that requires further research considering that the situation of the Somali refugees has lasted for a quarter of a century while the Zimbabwean asylum-seekers by every indication constitutes a fresh emergency deserving of humanitarian response but has been neglected. Due to the fact that humanitarian emergencies happen unpredictably and unprecedentedly in the sense that the circumstances are not always the same, for want of better protection of human rights in such situations greater attention needs to be given to the manner in which humanitarian response is planned and carried out. In this regard, I make the following three suggestions: first, I suggest that the needs-based duty to assist and the rights-based duty to protect must be equally prioritized and mainstreamed in the entire process of humanitarian action. This is essential if action is to become more effective in ensuring most importantly the right to life with dignity. For example, if the South African government and humanitarian organizations could consider providing the Zimbabwean asylum-seekers the most basic survival needs like shelter, food and health care for the simple reason that they too are human beings. The Kenyan government may also need to consider integrating the Somali refugees for reasons that in twenty five years, most of them have become more Kenyan than Somali. Secondly, humanitarian response should be provided equitably and indiscriminately in every emergency if justice is to be done to humanity as a whole. Thirdly, as a measure of protection, humanitarian agencies owe a duty to create awareness about neglected humanitarian emergencies that deserve intervention. In this regard, they need to draw states’ attention to their treaty obligations to provide humanitarian assistance to the refugees and asylum-seekers within their territories. These measures may ensure that humanitarian policies become more human rights focused and that displaced populations who cross an international border with a genuine reason to seek refuge in another country will be treated equally not only based on their needs but also on their right to receive humanitarian assistance. I am profoundly grateful to the IIHA, Fordham University for the scholarship to participate in the IDHA 38 course where I developed my interest in humanitarian work. My gratitude also goes to Prof Larry Wollingworth and Prof Anthony Land for their inspiration and also to Dr Alexander van Tulleken for his comments on the original draft of this paper and encouragement to develop the paper for publication. The Sphere Project, (2011) Humanitarian Charter and Minimum Standards in Humanitarian Response, The Sphere Project, p. 20. Lowrie, S. (2001) “Reflections on the Humanitarian Charter”, Humanitarian Exchange, No. 19, p. 37. See Center for Constitutional Rights et al, “A call for human rights-based approach to humanitarian assistance for Haiti”, available at: https://ccrjustice.org/files/100114_HaitiAid_Statement_FINAL.pdf (accessed: 1 October 2014). UNHCHR, “Human rights in humanitarian emergency response: A contribution from the special procedures mechanisms”, Office of the United Nations High Commissioner for Human Rights, available at: http://www.un.org/en/ecosoc/julyhls/pdf10/ohchr_leaflet_side_evnet_ecosoc.pdf(accessed: 1 October 2014). UN News Centre, (2012) “UN-run camps for Somalia refugees in Kenya enter 20th year of existence”, available at: http://www.un.org/apps/news/story.asp?NewsID=41307#.VMIoA9KUeE4 (accessed: 20 December 2014). CoRMSA, (2009) Protecting Refugees, Asylum Seekers and Immigrants in South Africa Consortium for Refugees and Migrants in South Africa, Johannesburg, p. 55. Kenya ratified the 1951 Refugee Convention in 1966 and the 1969 OAU Refugee Convention in 1992 while South Africa ratified the 1951 Refugee Convention in 1996 and the 1969 OAU Refugee Convention in 1995. Betts, A. (2013) “State fragility, refugee status and ‘survival migration’”, Forced Migration Review, Issue No. 43, p. 4. The causes for refugee movements around the world are much broader than are captured in the 1951 Refugee Convention. Going by the 1951 Convention, the situation in Zimbabwe does not qualify the persons displaced to pass the refugee test. Meanwhile, the situation did cause the displacement of large numbers of persons, maybe more than in other situations that may fall within the 1951 Convention definition of refugee. The 1969 Refugee Convention provides a more expanded definition of who might be considered a refugee under international law. Abraham, G. (2012) “International humanitarian law and human rights law”, IDHA 38 Lecture Notes, p. 17. The International Bill of Human Rights comprises of the Universal Declaration of Human Rights of 1948, the International Covenant on Civil and Political Rights of 1966 and the International Covenant on Economic, Social and Cultural Rights of 1966. The Sphere Project (n 1), p. 20. Abraham, 2012 (n 13), pp. 11-14. IFRC, (2000) “Disaster emergency needs assessment”, International Federation of Red Cross and Red Crescent Societies, p. 7. Khaire, H. (ed), (2011) Horn of Africa Annual Report 2011 Norwegian Refugee Council, pp. 10-11. Mlambo, A. and Raftopoulos, B. “The regional dimensions of Zimbabwe’s multi-layered crisis: An analysis”, available at: http://www.iese.ac.mz/lib/publication/proelit/Alois_Mlambo.pdf(accessed: 23 February 2015). OAU Convention Governing the Specific aspects of Refugee problems in Africa 1969, Art. 2(2). Convention Relating to the Status of Refugees 1951, Art. 3; 1969 OAU Convention (n 20), Art. 4. Norwegian Refugee Council, (2008) Camp Management Toolkit, The Camp Management Project, p. 23; The Sphere Project (n 1), p. 21. The Sphere Project (n 1), p. 21. UN News Centre (n 6). Chebichi, J. (2009), “The ‘legality’ of illegal Somali migrants in Eastleigh Estate in Nairobi, Kenya”, Masters Dissertation, University of Witwatersrand Johannesburg, p. 19. UNHCR, (2012) “UNHCR country operations profile – South Africa”, available at: www.unhcr.org/cgi-bin/texis/vtx/page?page=49e485aa6 (accessed: 22 November 2014). Chebichi (n 26), p. 20. UNHCR, (2013) “Kenya: Repatriation process to Somalia starting, must be voluntary”, Briefing note, available at: http://www.unhcr.org/52948a7d9.html (accessed: 23 January 2015). Amnesty International, (2014) “Somali refugees unlawfully forced out of Kenya”, available at: https://www.amnesty.org/en/articles/news/2014/02/kenya-somali-refugees-unlawfully-forced-out-country/(accessed: 23 January 2015). Mohamed, A. (2014) “Kenya: Somalia pulls out of refugee talks again” The Star, August 2014, available at: http://allafrica.com/stories/201408180682.html (accessed 22 January 2015). 1951 Refugee Convention (n 22), Art. 33. UNHCR, (2010) UNHCR Global Appeal 2010-11: South Africa, United Nations High Commission for Refugees, p. 116. UNHCR 2012 (n 27 above). CoRMSA (n 7), p. 55. Betts, 2014 (n 9), p. 5. Wikipedia “Dadaab”, available at: http://en.wikipedia.org/wiki/Dadaab (accessed: 25 February 2015). OAU Refugee Convention, Art. 1(2). Jost, S. et al, (2012) “The effects of xenophobia on the integration of migrants in South Africa: An NGO perspective”, International Organisation for Migration, p. 7. See Immigration Regulations of 26 May 2014, Sect 18. De Jager, N. & Hopstock, N. (2011) “Locals only: understanding xenophobia in South Africa”, Strategic Review for Southern Africa, Vol. 33, No. 1. Pedersen, J. (2012) “Undocumented migrants and urban humanitarianism”, Médecins Sans Frontières, IDHA 38 Lecture, Pretoria, pp. 7-12. McNamara, D. (2004) “A sense of justice” in Kevin, M. and Cahill, M.D. (eds) Human Security for All: A Tribute to Sergio Vieira de Mello New York: Fordham University Press, p. 185. American Society of International Law, (1935) “Article 27: Violation of treaty obligations”, American Journal of International Law, Vol. 29, p. 1077, available at: http://www.jstor.org/stable/2213694 (accessed: 23 January 2015). See OAU Refugee Convention (n 20), Art. 2. Norwegian Refugee Council (n 21), p. 55. The definition that I conceptualize of “xenophobic nationalism” derives from the concept of xenophobia and the concept of nationalism put together. Jost et al (n 40), p. 2. Harris, B. (2002) “Xenophobia: A new pathology for a new South Africa?”, in Hook, D. & Eagle, G. (eds) Psychopathology and Social Prejudice, Cape Town: University of Cape Town Press, p. 181. Jost et al (n 41), p. 6. Danielsen, M. “I’m not really a Somali, yet I’m not a Kenyan either: I think I am more of a Dadaabian”, Daily Nation Online. De Jager & Hopstock (n 42). South Africa.info, “The Constitution of South Africa”, available at: http://www.southafrica.info/about/democracy/constitution.htm#.VOtCQSw6-J8 (accessed: 23 February 2015). UN Human Rights, (2013) Realizing the Right to Development, New York and Geneva: United Nations, p. 11. Ngang, C.C. (2014) “Reflections on the realisation of the right to development in Africa within the framework of international cooperation”, Conference paper presented at the International Conference on Law, Athens 14-17 July 2014 p. 24. Care International, (2014) “Learning from crisis: Strengthening humanitarian response since the 2004 Indian Ocean Tsunami”, Care International, p. 3; Braatberg, E. (2013) “Doing well by doing good: The role of humanitarian aid in Europe’s global strategy”, Swedish Institute of International Affairs – UI Brief No 20, p. 4. See common Art. 2 of the Universal Declaration of Human Rights, International Covenant on Civil and Political Rights and International Covenant on Economic, Social and Cultural Rights. Mackintosh, K. (2000) “The principles of humanitarian action in international humanitarian law”, Humanitarian Policy Group – Overseas Development Agency, p. 8.